California Regional Multiple Listing Service Inc. (CRMLS), the U.S.’s largest multiple listing service with more than 70,000 members, has signed a multiyear deal to give its members access to international listings and to market its listings with global networking and property marketing network Proxio Inc.
As part of the deal, CRMLS members gain access, and supply listings branded with the CRMLS logo, to Proxio’s “international MLS,” which currently features 3.2 million listings from 140 countries. Each listing is viewable in 19 languages and 30 currencies. Members also receive a search widget that translates the property listings on consumer searches of its Internet Data Exchange (IDX) database — those listings in the CRMLS database shared among its brokers. As part of the deal, Proxio created a profile for every CRMLS member and brokerage in its Proxio Pro network and connected all their listings to their profiles, Proxio CEO and co-founder Janet Case told Inman News. Access to the Proxio Pro network of more than 600,000 agents. A search widget that can be added to an agent’s website that converts a consumers’ search of the MLS’s Internet Data Exchange (IDX) listings into 19 languages. Access to Proxio’s SocialSearch app — adapted from the firm SocialKandy that Proxio acquired last September — that embeds property search into Facebook and ties consumers’ search activities to that member’s Facebook profile. CRMLS purchased the first two items for its members, Case said. “With the addition of Proxio international and multilingual services, our members are now equipped to expand their marketing to reach buyers all over the world and to better serve multicultural clients within their local markets,” said Adrese Roundtree, chief operating officer of CRMLS, in a statement. 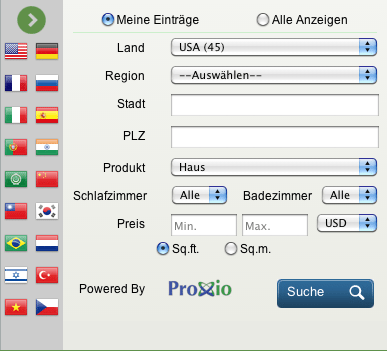 Currently, Proxio translates listings into the following 19 languages: English, Spanish, French, Portuguese, German, Italian, Dutch, Czech, Turkish, Hebrew, Russian, Japanese, Chinese traditional, Chinese simplified, Vietnamese, Korean, Hindi, Brazilian Portuguese and Arabic. The Santa Clara, Calif.-based firm, which claims that 600,000 real estate pros are in its global network, partners with national real estate associations in Brazil, Costa Rica, France, India, the Philippines and Bulgaria. Other partners include the International Real Estate Federation (FIABCI), the Asian Real Estate Association of America (AREAA), and U.S. Realtor associations and multiple listing services including the Miami Association of Realtors. Proxio, which has packages geared to agents and brokerages, too, announced in April 2012 that San Francisco-based brokerage Pacific Union International, Esslinger-Wooten-Maxwell (EWM) of Florida and Intero Real Estate Services in California’s Silicon Valley joined the network. Last October, Keller Williams Realty, which claims to have more agents in North America than any other franchisor, signed a five-year agreement with Proxio. Proxio agent packages start at $9.99 per month or $99 per year. Broker plans start at $990 per year or $99 per month (with a $99 start-up fee) for firms with up to 20 agents. MLS pricing is not broken out at Proxio’s website. Other MLSs that have deals with Proxio include Orlando, Fla.-based My Florida Regional MLS and Sunnyvale, Calif.-based MLSListings Inc.